There was a two-season gap in between the time that Hal Chase, the Yankees’ first great first baseman left the team in 1912 and Wally Pipp, the franchise’s second great first baseman took over that position in 1915. Charley Mullen was one of the interim first sackers New York used to fill that gap. This native of Seattle was 25 years old when Yankee manager Frank Chance began starting him during the 1914 season. He wasn’t a disaster. Mullen hit .260 that year, which was actually third best among the team’s starting lineup and he drove in 44 runs, which was also third best on the squad during that low-scoring deadfall era. Just before the 1915 season began, the Yankee franchise was purchased by brewer Jacob Ruppert and his partner Tillinghast Huston. The two men had been assured by AL President Ban Johnson that the Junior Circuit’s other team owners would help the Yankees become more competitive with their New York City neighbors, the Giants. The plan was to have the other clubs make some of their best players and prospects available to New York for acquisition. One of the first such acquisitions made by the new Yankee ownership was Pipp, a young hard-hitting Detroit Tiger prospect who would start at first for New York for the next decade until his famous headache opened the door for Lou Gehrig. So what happened to Charley Mullen? He actually remained a Yankee for the next couple of seasons in a utility role before returning to the minors. 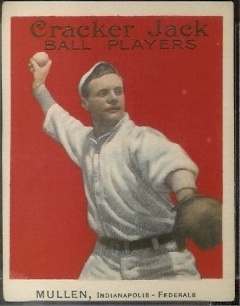 He played his final season in 1919 with the Seattle Raniers of the Pacific Coast League. He remained in his hometown after he retired and died there in 1963 at the age of 74. Mullen shares his birthday with this former Yankee outfielder, this one-time Yankee third baseman and this one too. If you love the Yankees, you hate, or at the very least dislike the Red Sox. But if you love the Yankees, you also find it easy to root for guys who at one time used to be Red Sox but now have landed in the Bronx and wear the pinstripes. If somebody told me in the late 1980s that I’d one day be praying Wade Boggs would drive in a runner from third or that Roger Clemens would strike out the sides, I’d have thought they were looney. Same goes for Johnny Damon fifteen years later. And more recently, it was Kevin Youklis. When he was with Boston, I hated seeing “The Greek God of Walks” stride up to the plate in a close Red Sox/Yankee game. I knew at the very least he’d get into that completely weird batting stance of his and put together a very good at bat, forcing whatever Yankee pitcher happened to to be on the mound at the time to throw at least a dozen pitches. It seemed as if more often than not, those Youklis at bats would end up with him driving in a huge run or he would at least get on base and put himself in position to score that run. I did not like this guy at all and then in December of 2013, he signed as a free agent with the Yankees, forcing me to root for him too. The problem with the signing was that it had been about four years since big Kevin had a good season. During his last two plus years in Boston, injuries and Bobby Valentine disrupted his game and he hit just .236 after getting traded to the White Sox in June of 2012. The only reason the Yankees came calling last winter and agreed to pay him $12 million was because A-Rod’s hip went bad. At the time of his signing, New York was hoping they’d only need him to start at the hot corner till Rodriguez recovered and returned at mid-year. With sluggers like Teixeira and Granderson still in the powerful Yankee lineup, they could even afford to absorb the mediocre bat Youklis had swung the previous few years. Joe Girardi just needed him to provide decent defense at third, use that great eye of his to earn frequent “walks” to first base and most importantly, stay healthy. After his first regular season month in Pinstripes, Youklis was on the DL. By the middle of June both his season and his Yankee career were over, forcing Yankee fans to once again look forward to getting A-Rod back on the field sooner rather than later. 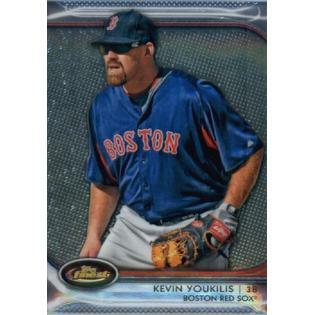 In 2014, Youklis is playing in Japan. He shares his birthday with this former Yankee outfielder, this long-ago first baseman and this one-time Yankee third baseman. 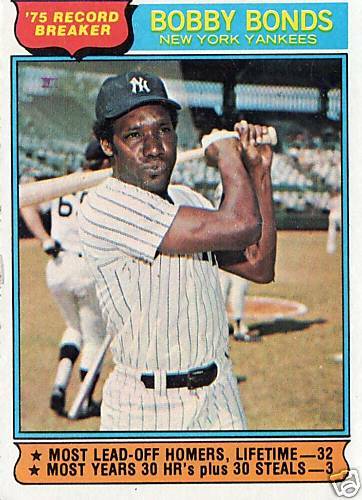 Bobby Bonds came to the Yankees in a blockbuster trade that sent Yankee fan favorite, Bobby Murcer to the Giants in 1974. After a strong 1975 season in Pinstripes, Bobby was traded to the Angels for Ed Fiqueroa and Mickey Rivers. Bond’s most memorable contribution to baseball was his son Barry. Bonds died of Lung Cancer in August 2003. I was 20-years-old when the Bonds for Murcer trade was made and can remember it as if it were yesterday. As a lifelong Yankee fan who had watched the Bomber dynasty crumble in the latter half of the sixties, Murcer was my favorite player at that time. He didn’t have superstar skills but he was the best player on some of the worst Yankee teams in the franchise’s hallowed history. I started watching baseball in 1960 as a six-year-old and back then, Yankee fans took for granted that every October we’d be able to watch our Bronx Bombers play in the World Series. And that was the case right up until 1965. Then, within a matter of just a few years, instead of rooting for guys like Mantle, Maris, Berra, Ford, Howard and Skowron to win a pennant, I found myself actually getting some satisfaction when players with names like Tepedino, Repoz, Whitaker, Amaro and Kenney could win just enough to keep my team out of the AL basement. Murcer, Mel Stottlemyre, and a new kid named Munson were pretty much the only bright spots for us Yankee fans during that bleak period and then “The Boss” showed up in the Bronx. After putting together and heading a group of investors that purchased the team from CBS in January of 1973, George Steinbrenner began looking to make huge changes to the roster almost immediately, convinced he could deal his team back into the World Series. He therefore was ready to jump at the opportunity to acquire Bonds from the SF Giants for Murcer. Baseball pundits at the time thought a lot more of Bonds’ skills than Murcer’s and they were right. Bonds was a genuine five-tool player who always seemed just on the verge of super stardom. Murcer on the other hand, earned his keep by playing hard every second he was on the field. Plus Bobby loved being a Yankee and always used to say that the saddest day of his life was the day the Yankees swapped him for Bonds. As it turned out, Steinbrenner was right about this one but not because Bonds ended up leading New York back to the Fall Classic. Instead, after just one pretty good year in pinstripes, the Yanks swapped him for Fiqueroa and Rivers who immediately became two critical cogs in the team’s drive to the 1976 World Series. This former Yankee third baseman, this much more recent Yankee third baseman and this long-ago first baseman also celebrate their birthday on March 15th. Only three Yankee third basemen have hit more than thirty home runs in a season. Graig Nettles did it twice and A-Rod has done it in each of the seven seasons he’s been in New York. Today’s Pinstripe Birthday celebrant, however, is the only third baseman who came up through the Yankee minor league organization to have hit more than 30 round trippers in one year. That happened in 1987, when the player they called “Pags” hit 32 home runs and drove in 87, both of which would end up being career highs for the native of Medford, MA. The Yankees drafted Pagliarulo out of the University of Miami, in 1981. He made the parent club in 1984 and replaced Toby Harrah as New York’s starting third baseman. Pags was a better than average fielder with good power but he struck out too much and could never get his batting average out of the .230’s. He was a hard-nosed type of player who always seemed to be wearing a dirty uniform. I remember he once got hit in the face by a pitch that smashed both his nose and lip into bloody messes. The next day he was back in the lineup wearing bandages all over his face. Both Billy Martin and Lou Piniella loved the guy but by 1989, both were gone and Pagliarulo’s average had slipped below .200. The Yankees shipped him to San Diego for starting pitcher, Walt Terrell. When he became a free agent after the 1990 season, he signed with the Twins and became Minnesota’s starting third baseman. He hit a career high .279, his first year in Minneapolis and helped the Twins win the 1991 World Series. 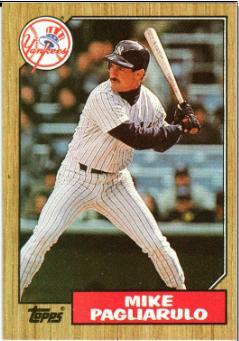 Pags played 11 big league seasons in all, retiring in 1995 with 134 career home runs, all but thirty of which were hit while he wore the Yankee pinstripes. He also played one year in Japan and after retiring, started a scouting service that helped Major League teams evaluate Japanese baseball talent. That company played a role in the Yankee signings of both Hideki Matsui and Kei Igawa. This former Yankee outfielder, this more current Yankee third baseman and this long-ago first baseman were also born on March 15th. On the afternoon of July 27, 2003, the Yankees were in Boston trying to win the rubber game of a three-game series against the Red Sox. All was going well for Joe Torre’s pinstriped minions up until the home half of the seventh inning. Yankee starter, Jeff Weaver was shutting out the Red Sox up to that point and New York had scored three runs off of Boston starter, Derek Lowe. But the seventh inning stretch proved to be the turning point that afternoon in Beantown. With one out, Weaver walked and then hit the next two Boston batters. Torre brought in Chris Hammond to relieve Weaver. Hammond immediately gave up back-to-back bombs to Jason Varitek and Johnny Damon and suddenly the Yankees were losing 4-3. The lead would expand to 6-3 before Boston made the final out of that inning and you would have to believe that Joe Torre, as calm as he always looked, must have been stewing. In the top of the eighth, with a man on first and nobody out, Torre sent up Todd Zeile to pinch hit for Robin Ventura. Red Sox manager, Grady Little countered by bringing in right hander, Mike Timlin to pitch to Zeile. Torre countered Little’s move by calling Zeile back to the bench and sending left-hand-hitting Karim Garcia to the plate. When Garcia struck out looking, Torre called on switch-hitter Ruben Sierra to pinch hit for the right-hand-hitting Raul Mondesi, who had started in right-field for New York that day. That move failed as well and the Yankees lost that game and that series to the Red Sox. As it turned out, they also lost Mondesi. Claiming Torre had disrespected him, the disgruntled Dominican immediately left the dugout after being removed from the game, got dressed and drove back to New York City. The real problem with that was that while Mondesi was motoring to the Big Apple, the rest of the Yankee team was flying to California to play a series against the Angels. After spending the night in New York, Mondesi flew to Anaheim to rejoin his team in time for the first game, at which point he found out his team wasn’t his team any more. He had been traded to the Diamondbacks. According to Mondesi, it wasn’t the fact that Torre pinch hit for him that was disrespectful. Instead, the outfielder was insulted because Torre did not personally deliver the message that Sierra was taking his place. And once Mondesi was traded, he was more than willing to share his dislike for Torre and the Yankees with the world. He claimed Torre discriminated against Dominicans and always showed favoritism to home-grown Yankees. That was not the first time a player had accused Torre of playing favorites and discriminating against players from the Carribean. Seven seasons earlier, another Latino outfielder made the same charges and was also traded by New York as a result. 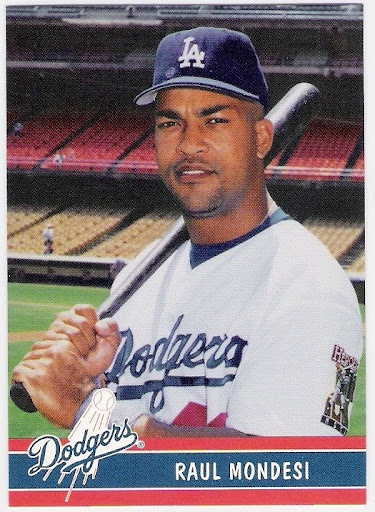 Ironically, that player’s name was Ruben Sierra. In any event, Mondesi faded fast after that trade, going from the Diamondbacks to the Pirates, to the Angels and then the Braves in a desperate and unsuccessful struggle to keep his big league career going. The 1994 NL Rookie of the Year ended that career with 271 home runs and a .273 lifetime average. He played a total of 169 games with New York during the 2002 and ’03 seasons, hitting 27 home runs and driving in 92 during that span. In my humble opinion, the word “respect” has become one of the most misused and misunderstood words in our society. Like Mondesi, this other former NL Rookie of the Year outfielder, this former NL All Star, this one-time Yankee center-fielder and this former Yankee backup first baseman each also had a March 12th birthday.